We donated one of our manufactured Winchester Model 1886 rifles to be auctioned off at the 2010 Safari Club International (SCI) Hunters Convention. The three-day event was held in Reno Nev. from January 21-23, 2010. Complemented by a hand-checkered walnut stock, the Turnbull Model 1886 rifle features the Winchester No. 10-style engraving. Other features include a 22 inch rust-blued octagon barrel, bone-charcoal case-colored receiver and the special serial number “SCI 2010.” Delivered in a canvas and leather luggage case, the Turnbull rifle comes with forty rounds of ammunition. 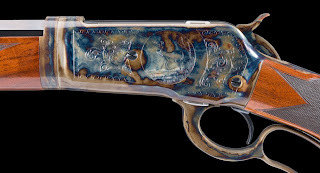 The Turnbull Model 1886 rifle sold at the SCI auction for $ 6,500. This money, along with the proceeds from the sale of other auctioned firearms, will benefit SCI’s Auction Program, a major source of funding in the fight to conserve wildlife resources and habitat, and protect people’s freedom to hunt. Checkout SCI Auctions. Day and night, the auctioneer gavel keeps falling on dream hunts and hunter-preferred items from around the world — all to fuel SCI’s hunter advocacy and wildlife conservation efforts.